Constituency betting is now a huge part of the overall betting market on the general election. 2010 was the first time that any bookmaker priced up every seat and we’ve given it a go again for 2015. It’s quite hard for us bookies to make any money out of this. It is a very difficult task to keep on top of 650 different local heats where, in theory, people on the ground might have access to lots of useful information that we don’t have. We were delighted to break even in 2010 – that was mainly because we took stacks of money on the Liberal Democrats to win lots of extra seats which they spectacularly failed to do. Streatham, Durham and Hull North were three of the most notable contests where Lib Dem punters got their fingers burnt. Ladbrokes took a nasty hit in quite a few seats. The Greens winning Brighton Pavilion was most unwelcome. However, the worst mistake we made was offering 100/1 about the Alliance Party winning Belfast East: We failed to realise that the popular ex-Lord Mayor of the city was running as their candidate and had to pay out thousands to clued up locals. Anyway, based on the last election and the money we’ve taken so far for 2015, I’m going to take a guess at the five seats that will generate the most betting interest next year. Nigel Farage’s presence will ensure this seat gets an enormous amount of media and polling attention and we’ve taken more money here than any other constituency so far. Initially available at 3/1, UKIP were backed down to 4/9 before yesterday’s Ashcroft poll which put the Tories ahead. The biggest betting heat of 2010 looks sure to be near the top again. The Greens’ rise in the national polls is a good sign for Caroline Lucas, but the performance of the Green led council might not be helping her chances. Potentially the tightest three way marginal in the country. The Lib Dem selection of popular Mayor Dorothy Thornhill has made this a live chance of being a surprise gain. Julian Huppert seems to be all over the telly these days and has a big job hanging on to his 7,000 majority in a student town. Chuck in high profile kipper Patrick O’Flynn and the possibility of a decent Green vote to make this one even more unpredictable. 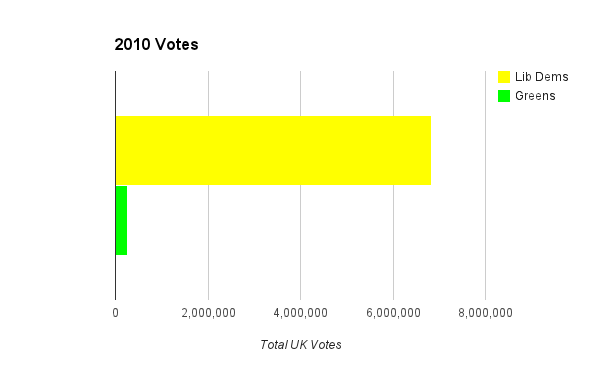 Is Danny Alexander’s high profile going to help or hinder his chances of holding on to a majority of almost 9,000 votes? The SNP’s odds have gone from 4/1 to 4/9, but recently we’ve seen a few shrewd judges backing the Lib Dems to hold on, despite their woeful Scottish poll numbers. Lord Ashcroft’s latest constituency polling contained some fascinating snapshots of some of the big betting seats, and has resulted in some major shifts in the odds. The most newsworthy finding is that Nigel Farage is in second place behind the Tories in Thanet South. Punters had been piling into UKIP to win the seat; over 90% of the money staked had been for them and their odds had plummeted from 6/4 into 4/9. We still make him favourite, now at 4/6, but surely the Tories have to be a good bet at 7/4? There must be a very strong chance that some of the substantial Labour vote will vote tactically to keep out Farage, if they reason that their candidate is unlikely to win. There was some pretty good news for the Lib Dems in a lot of these seats, but this was an exception; no doubt due to the fact that sitting MP Mike Hancock has been thrown out of the party and there is not going to be any incumbency advantage for them to fall back on. The Tories are now Evens from 5/2 to overturn the 5,200 Lib Dem majority. Doncaster North; could UKIP unseat Ed Miliband? With Labour showing at 40% in this poll and UKIP in a clear second place, tactical voting from Conservative supporters could put the Labour leader in danger. We cut the odds of a shock UKIP win from 12/1 to 8/1. 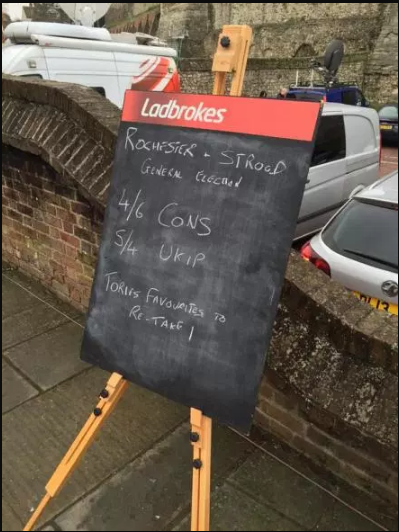 The morning after last week’s Rochester and Strood by-election, we made the Tories 4/6 favourites to re-take the seat next May. Punters have been even more bullish and the Conservatives are now even stronger favourites, at 1/2, with UKIP drifting out to 6/4. According to our individual constituency prices, that means Rochester & Strood is now the eighth most likely win for UKIP at the general election. The UKIP win % is the chance of them taking the seat at the general election, as implied by our odds. So, 15 of their top 20 prospects are Tory held seats although it’s worth pointing out that UKIP might prevent Labour from winning seats like Thurrock, Yarmouth and Cannock Chase which would all be very high on Ed Miliband’s target list. SNP now favourites to win most Scottish seats. There’s been a bit of a gamble on the SNP to win the most seats in Scotland in next May’s general election. Available at 11/10 this morning, a rush of money has seen them move into 8/11 favourites. There hasn’t been any particularly new polling or news developments over the weekend that I am aware of to cause this. When you get this sort of move, it’s most likely some kind of tipping line, or perhaps a coordinated group of gamblers. So, if they win every seat in which they are favourites, that still only leaves them with 17. They will likely need to win around 27 in order to be the largest party in Scotland. Which probably indicates that either our constituency odds for the SNP are a little too generous or that Labour are a good price at Evens to win most seats. I expect the answer probably lies somewhere in the middle. Could the Greens beat the Lib Dems at the General Election? We’ve cut the odds on the Greens out-polling the Lib Dems in 2015 from 5/1 to 4/1 today. That follows last night YouGov poll which put the Greens ahead. Pretty staggering considering that at the last general election the Liberal Democrats got twenty five times as many votes as the Greens. There’s a good Telegraph article here which highlights some of the main issues behind the Green rise in the polls. I think there are a couple of factors which would make me slightly wary about taking the 4/1 though. 1. How many candidates will they stand? In 2010, the Greens stood in just 310 UK constituencies i.e. under half. This time they are reported to be aiming for three quarters, which would be something around 490. No matter how bad things get for the Lib Dems, I’m sure they will still be on the ballot in the 631 seats outside of Northern Ireland (and the Speaker’s seat).So the Greens would have to get 28% more votes per seat contested than the Lib Dems to outscore them nationwide. That might not be as difficult as it sounds; presumably the seats they won’t contest will be the less favourable ones for them anyway. 2. Will they fade away in the campaign? If the current TV debate proposals go ahead, then Nick Clegg will be in two of the three debates. The Greens won’t feature in any. The Green’s most skilled media performer, Caroline Lucas, will be busy trying to hang on to their one seat in Brighton Pavilion (she’s currently a marginal favourite), so the face of their campaign will be leader Natalie Bennett, who hasn’t convinced everybody yet.